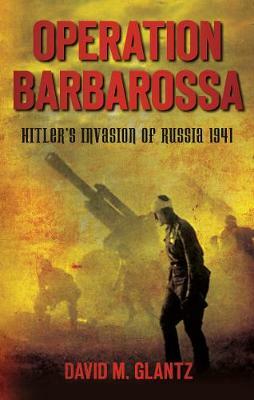 On 22 June 1941 Hitler unleashed his forces on the Soviet Union. Spearheaded by four powerful Panzer groups and protected by an impenetrable curtain of air support, the seemingly invincible Wehrmacht advanced from the Soviet Union's western borders to the immediate outskirts of Leningrad, Moscow and Rostov in the shockingly brief period of less than six months. The sudden, deep, relentless German advance virtually destroyed the entire peacetime Red Army and captured almost 40 percent of European Russia before expiring inexplicably at the gates of Moscow and Leningrad. An invasion designed to achieve victory in three to six weeks failed and, four years later, resulted in unprecedented and total German defeat. David Glantz challenges the time-honoured explanation that poor weather, bad terrain and Hitler's faulty strategic judgement produced German defeat, and reveals how the Red Army thwarted the German Army's dramatic and apparently inexorable invasion before it achieved its ambitious goals.